In 'The Canterbury Tales', Chaucer created one of the great touchstones of English literature, a masterly collection of chivalric romances, moral allegories and low farce. him two sons and two daughters. 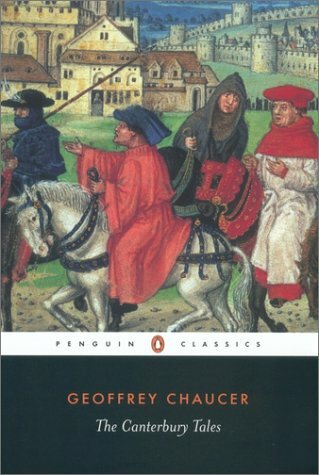 Chaucer remained in royal service traveling to Flanders, Italy, and Spain. These travels would all have a great influence on his work. His early writing was influenced by the French tradition of courtly love poetry, and his later work by the Italians, especially Dante, Boccaccio, and Petrarch. Chaucer wrote in Middle English, the form of English used from 1100 to about 1485. He is given the designation of the first English poet to use rhymed couplets in iambic pentameter and to compose successfully in the vernacular. Chaucer's Canterbury Tales is a collection of humorous, bawdy, and poignant stories told by a group of fictional pilgrims traveling to the shrine of St. Thomas a Becket. It is considered to be among the masterpieces of literature. His works also include The Book of the Duchess, inspired by the death of John Gaunt's first wife; House of Fame, The Parliament of Fowls, and The Legend of Good Women. Troilus and Criseyde, adapted from a love story by Boccaccio, is one of his greatest poems apart from The Canterbury Tales. Chaucer died in London on October 25, 1400. He was buried in Westminster Abbey, in what is now called Poet's Corner. Geoffrey Chaucer (c.1342-1400) had a career in royal service as a member of the court and a diplomat. His literary work, notable for its range of genres, helped establish the English literary tradition. Nevill Coghill (1899-1980) held many appointments at Oxford University. His translation of Chaucer's Troilus and Criseydeis also published by Penguin Classics.